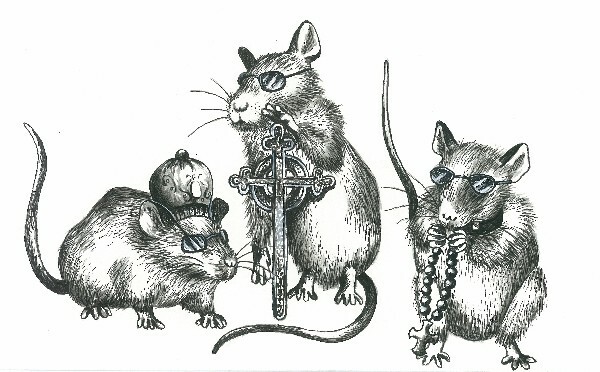 The three blind mice were living happily in their home within the walls of the farmer’s house. One day, the farmer’s wife heard the mice in the walls and sprayed rat poison everywhere. The poison did not kill the mice but instead, turned them into criminals. As each day went by, the rats committed felonies and they were all somehow directed towards the farmer’s wife. One morning, the three mice attacked and charged at the farmer’s wife, leaving her stunned and called the police. The farmer was a witness of the whole stunt. Once the police came, they arrested the mice and discussed the arraignment for court with the farmer and wife. While the mice were locked away, the Grand Jury examined the case and gave their opinion on what is to come. When the trial came, the mice had no money so they had to get a public defender to represent them. Since the mice had no money to get a lawyer, they had no money to be bailed out. The mice did not want to go to court but the subpoena required them to show up. Once the trial began, the mice were lying under oath and their indictment was accompanied by perjury now. The defendants were in major trouble now. The judge saw that the convicted mice were trying to plea bargain so he told them that this is not a petit jury. The judge said that the verdict was final and later prosecuted the mice. The mice appealed the decision but it was rejected. When the mice were sent to jail, the farmers wife broke into the cell and cut their tails off then killed them all.